Quilted Northern Ultra Soft & Strong Supreme Roll toilet paper offers a comfortable clean you can count On with signature 2-ply softness and flexible strength. Soft & Strong toilet paper is designed to limit ripping and separation wiith a signature Quilted Northern emboss that delivers the softness and strength you love. Quilted Northern Ultra Soft & Strong is 100% biodegradable - it's flushable and septic safe for standard sewer and septic systems. Quilted Northern toilet paper is Sustainable Forestry Initiative (SFI) certified. For more than 100 years, Quilted Northern bathroom tissue has stood for softness, strength, and overall quality and comfort. Get this brand you can trust delivered to your door for up to 15% less with Subscribe and Save option. 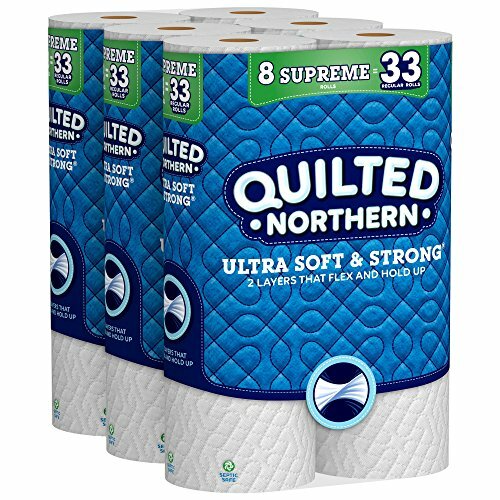 This is a bulk pack of 24 Quilted Northern Ultra Soft & Strong Supreme toilet paper rolls, equivalent to 96 regular rolls. Each roll has 340 sheets for fewer roll changes. The rolls are sized to fit standard dispensers.